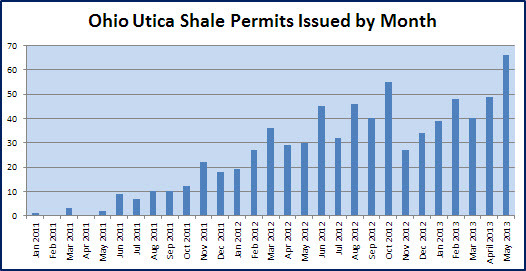 Ohio Utica Shale permits were issued at a new monthly high in May 2013 at 66, compared to the previous high of 55 in October 2012. Permits issue so far in June, as of June15th, are at 43, and poised to set another monthly record. The real vote of confidence will come with increased drilling activity, still off highs from 2012, attributed primarily to Chesapeake's exit, but permit activity is still a good signal that interest remains high. Just 14 wells are currently classified as "drilling" in the latest weekly June numbers reported today. Last year at this time, Chesapeake alone accounted for 17 wells drilling of 35 drilling at the time. Gulfport Energy, drilling 6 wells according to the latest report, was only drilling 1 well this time last year. Natural gas prices were close to $2.7 this time last year vs. $3.9 today, so one might wonder why more drilling is not occurring. Focus by oil and gas companies on the more lucrative liquid plays (shale oil especially) and less wet gas and oil produced from the Utica than initially hoped for are likely two factors driving down drilling activity, but rising natural gas prices should bring drillers back.New infrastructure to transport the natural gas to local processing facilities should also create more profitable scenarios for producers. Marianne Kah, Economist at ConocoPhillips said in a recent Forbes article that LNG exports would increase natural gas by about $1, keeping gas prices below $6. At the same time, chemical companies like Dow, which alone plans to invest $4 billion in natural gas powered ethylene and propylene plants this year, are concerned that even higher natural gas prices will make their investments unprofitable or only marginally so. Higher natural gas prices and other factors point to a likely increase in Utica activity in the months and years to come.